Shade sails are an attractive, practical, inexpensive, durable and environmentally friendly way to shelter from the harsh Australian elements. Shade sails are an Aussie icon. They are ubiquitous in Australian homes, businesses, and educational and recreational facilities. The reasons for their popularity are not hard to understand. They are an attractive, practical, inexpensive, durable and environmentally friendly way to shelter from the harsh Australian elements. They are easy to install and take down, easy to keep clean, and easy to transport from one place to another. They offer dazzling choice in their range of popular colours and other features. Looked after carefully, they will last well beyond their warranty, and even for life. What’s not to love? Australian Shade News is a new e-newsletter dedicated to all things shade sail. 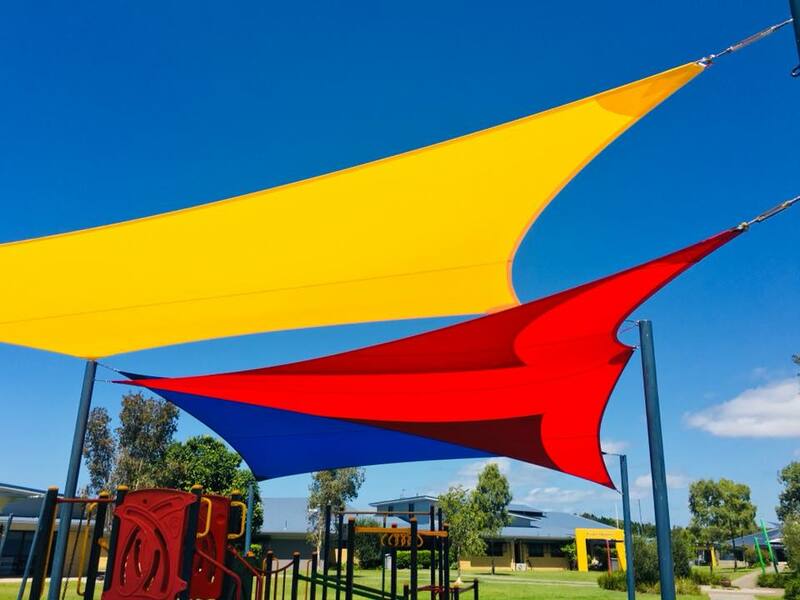 Whether you are considering investing in your first shade sail, want to inform yourself to make the best choice of sail, or are after an authoritative source of information about how to install, maintain and care for your shade sail, Australian Shade News is for you. This newsletter will also keep you up-to-date with all the latest product and consumer news relating to shade sails. Australian Shade News is your product and consumer guide. We hope you enjoy this first issue and invite you to contact us with your questions, feedback and suggestions. GSM in shade sails: What do I need to know? Choosing the right shade sail for your needs can seem complicated at first – so many features to compare and factors to take into account. What is GSM then, and what does it mean when you are choosing a shade sail? GSM stands for grams per square metre. So, it is a measurement of the weight of the shade cloth, and it also gives an indication of its relative strength. A cloth with a GSM of 150 is lightweight, and suitable for sheltered areas, while a cloth of 320 GSM is a heavy-duty product. This would make it suitable for areas exposed to heavy weather, such as ocean-frontage, as it is very resistant to tearing. High GSM cloth is also generally better suited for large spans, such as across commercial-sized pools. GSM can also be taken as a broad indication of UV blockage – but be careful: UPF is the indicator for shade sails about UV protection, and it is a completely separate thing to GSM. You should always check your individual product for its UPF factor. See our story below about how UPF works in helping you keep solar radiation to a minimum with your shade sail. Where will you be rigging your sail, and what will its exposure to the elements be there? What time of year will you use it, or is it to be a permanent fixture? How big is the area that you wish to cover with your shade sail? How sturdy are the anchoring points for your sail? We recommend the highest practical GSM for most circumstances, except for semi-permanent usage in small, sheltered areas. For detailed advice about the best choice for you, contact us today. Your shade sail is a fantastic, and environmentally friendly, investment that will keep you shaded and sheltered all year round for very little expense and upkeep. Storm season brings its challenges, however, for shade sails as well as everything else. But the first essential step to enjoying your shade sail safely is correct installation and tensioning. This will prevent it from sagging, even for many years, and reduce the risk of it tearing in high weather. You will also help to prevent sagging by pitching it at angles that avoid collecting water and leaf debris. Also, make sure that you anchor your shade sail securely to appropriately sturdy walls or posts that will not move or wobble even in high winds. Paying attention to these factors will help ensure that your shade sail stays safe and secure from bad weather. 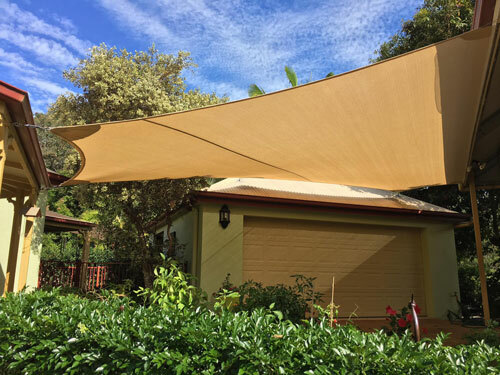 If, however, like many Queenslanders, you live in areas that are prone to cyclones or frequent strong storms, you can minimise risks in the face of strong storm warnings by temporarily taking down your shade sail. This means it is well worth knowing how to correctly DIY install and take down your shade sail even if you had it professionally installed in the first place. If you have a shade sail that you are unsure how to take down and re-install correctly, contact us today for a site visit and tailored instruction. Keep your shade sail safe for storm season – and preserve your peace of mind. Choosing the best quality shade sail is not as difficult as it might at first seem. Go for the best quality materials and workmanship you can afford, plus the best customer service. It will pay off in the short run as well as the long run. 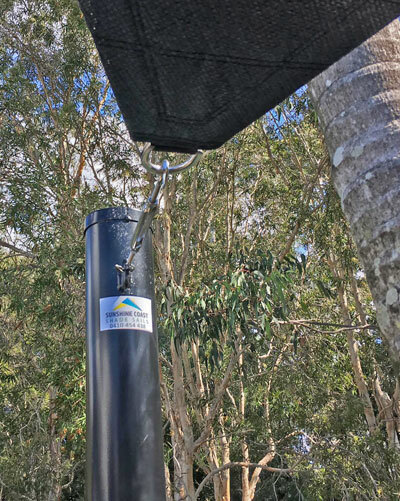 One important but the often-neglected factor is to check that the hardware for your shade sail is manufactured in marine-grade stainless steel to resist rust and wear in all weather. Your supplier should provide you with all the hardware you need at the time you purchase your sail, plus supply any extra material you might need down the track. Your components will vary depending on the size and weight of your sail and what you attach it to. We show you below some of the most important items, and de-mystify them. 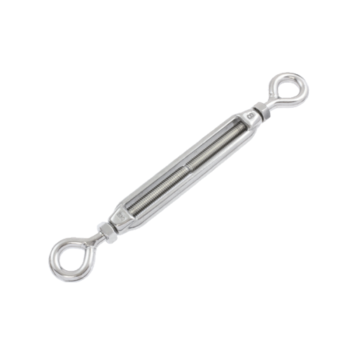 Turnbuckles are used to tension shade sails of all sizes. Shackles are used to fit shade sails. Fit them over the ring of the shade sail, and put the pin into the eyebolt or turnbuckle. 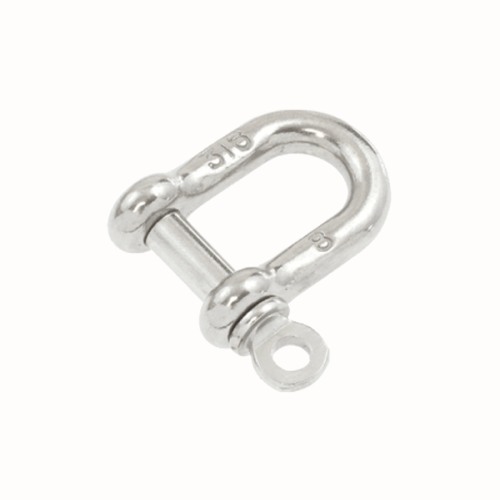 TIP: Prevent the shackle pin from working loose by tying a galvanised wire around it. 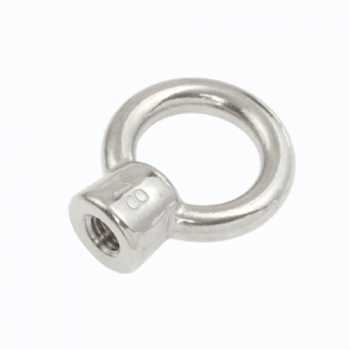 Eye nuts are used at shade sail attachment points to fit threaded bolts and rods. This general purpose item with a spring-loaded tongue is used to link chains to hold sails in place. They are not designed for heavy loads. Eye nut bolts provide a strong point of attachment for sails. Internal corner brackets provide a strong way to attach sails to the internal corners of suitable brick or concrete walls. As above, for the external corners of suitable brick or concrete walls. Plates of different sizes and shapes will spread the load when attaching a sail to a brick or concrete wall. Anchors allow for shade sails to be fitted to roof lines and are a handy alternative to posts. This strong and flexible rope with application to the rigging of shade sails. This high-quality chain also used to rig shade sails. Our list is just a selection of the more common hardware items that may be used to install and rig a shade sail. Each comes in a variety of specifications. For more information about these items and more, or about installing and rigging your shade sail, contact us today. Shade sails are a superior household and commercial product. For safety, quality and consumer reasons, they are subject to numerous national and international policies, standards and legislation. In this regular column, we will keep you informed and up to date with all the formal standards that apply to the safe use of shade sails. This issue we explore Australian UPF standards. Seeking out shade and shelter is a vital part of this strategy. Skin cancer is a significant public health problem in Australia. Queenslanders have the highest rate of skin cancer in the world with two in three people developing at least one cancer in their lifetime. Blocking UV radiation is essential. Over-exposure to it can cause sunburn and long-term skin damage and increase the risk of developing skin cancer, including deadly melanomas, in the future. The UPF (Ultraviolet Protection Factor) rating on your shade sail is an indication of how effectively the cloth blocks ultraviolet radiation from the sun. It is tested in Australia and New Zealand to standard AS/NZS4399 by the Australian Radiation Protection and Nuclear Safety Agency. The table above shows the relationship between UPF rating and the percentage of UV blocked. You might also see the term “cover factor” when you are reading about shade sails or comparing products. Cover factor also varies between shade sail products, but it is a measure of the percentage area of fabric covered by the yarns and fibre, or how much light can pass through the gaps in the fabric. So, it has some relationship with UPF but it is not the same thing. It is tested to a different standard, AS4174, 1994 Synthetic Shadecloth, and has three categories: light, medium and heavy. It is not a measure of the UPF, or of the weight of the cloth. A shade cloth can be light in weight and light in cover factor but still be in the “Excellent” protection category for UPF. It is UPF that you should always pay attention to when you are assessing the ability of a shade sail to protect from ultraviolet radiation. 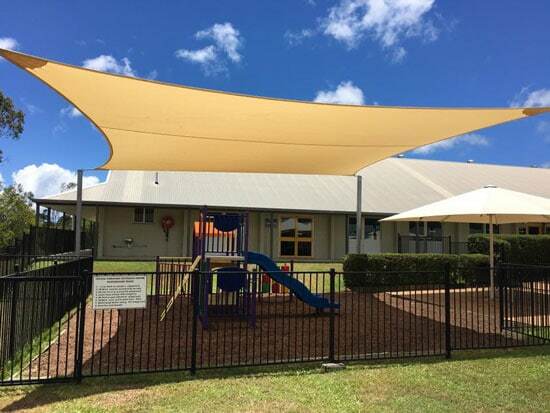 UPF50+ is required for shade sails in Queensland schools. It is very important that children and adolescents are not over-exposed to UV radiation, as these are critical periods during which sun exposure is likely to contribute to skin cancer later in life. It is UPF that you should pay attention to when assessing the ability of a shade sail to protect from ultraviolet radiation. Each issue we will present a new question that we have been recently asked by a client. “You should simply use mild detergent (sugar soap) and water to regularly clean your shade sail. Choose dry weather to do this, so that the shade sail dries quickly, with no chance of mould or mildew forming. If you have harder-to-remove dirt and grime, a commercial-grade cleaning product will be required (such as Wet & Forget). Choose a detergent that does not contain any bleach or mould removal products, as they will greatly reduce the lifespan of your shade sail. Use a garden hose (never a pressure hose) and a soft bristled brush and holding the hose at a safe distance, work over the shade sail in sections. There is no need to uninstall the shade sail to clean it, and we don’t recommend it. A ladder should help you to reach the highest parts of the shade sail.